A good friend of mine, who I’ll call Carmine Sandiego because I never know where in the world he is, has no interest whatsoever in birds. Nonetheless, he respects my own obvious enthusiasm to the extent that he tries to get me good avian photos from his travels. A batch from a recent trip to the Galapagos Islands proved inspiring, to say the least. The Galapagos Islands, a province of Ecuador, consists of an enticing array of volcanic islands clustered around the Equator. The archipelago is renowned for its impressive diversity of endemic or native animals. Since Darwin essentially put the Galapagos Islands on the map as far as the global scientific community is concerned, the birds most commonly associated with these islands are finches. Darwin’s finches, as they are known, are credited with a critical role in the formulation of Darwin’s theory of evolution by natural selection. Thirteen or so of these birds live in these islands, all of them endemic. Surprisingly, they are not finches at all; instead of belonging to Fringillidae, they are often grouped in the family Emberizidae with New World sparrows and Old World buntings, or alternately with tanagers in Thraupidae. However, the Galapagos are home to many other interesting avians. 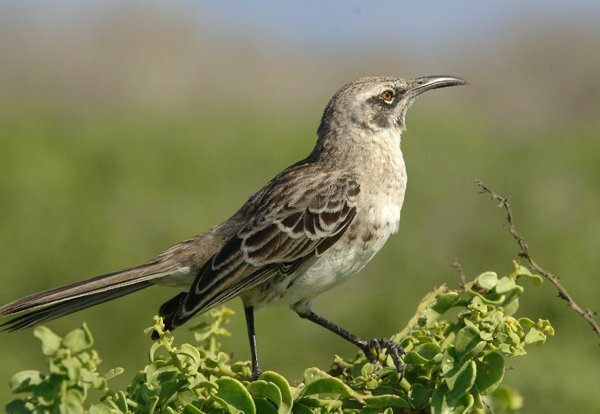 For example, the islands claim no less than four endemic mockingbirds (Galapagos, Charles, Hood, and San Cristobal,) quite amazing when you consider that only one mockingbird is typically found throughout North America above Mexico. Many of the noninvasive land birds found on the Archipelago de Colon, as it’s officially known, are found nowhere else in the world. Galapagos has its own rail, dove, flycatcher, and martin. It also has its own hawk, which shares raptor responsibilities with Osprey (of course! ), Peregrine Falcons, and Barn and Short-eared Owls. One would expect a tropical island chain to boast a healthy diversity of larids, shorebirds, waterfowl, waders, and pelagic species. On this score, Galapagos certainly does not disappoint. The islands are exceptional for frigatebirds, terns, and gulls, including native Swallow-tailed and Lava Gulls; the latter species is considered one of the world’s rarest gulls. Also found here are four different species of booby (Blue-footed, Red-footed, Masked, and Nazca) with a fifth popping up occasionally. Among the other unique species to call these islands home are the Waved Albatross, Flightless Cormorant (really flightless! 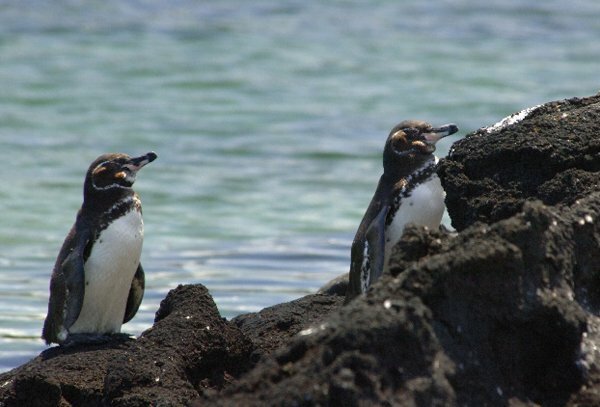 ), and Galapagos Penguin. The native penguin, one of the world’s smallest, enjoys the distinction of being the only penguin found naturally north of the equator. Cool! Great pictures, Mike. 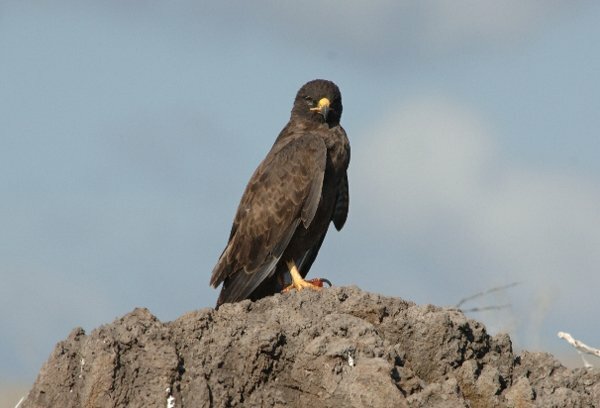 I especially appreciate the shot of the Galapagos Hawk. When I went with to the Galapagos Islands last January on the M/V Evolution, the naturalist on board was showed me to the favorite rock of the Galapagos Hawk, and he landed there right in front of me. It could be the very rock you photographed. I was just working on a report and came across your website. These birds are amazing. The Lord created these birds with the ability to adapt to cetain envierments. That’s right, evolution is not making these birds change. Birds already have this information required in their genes. It is called adaptation, not evolution. Evolution is when a dog evolves into a cat or an ape into a human, but that has never been observed. Also, if evolution is possible, which it is not, why are we not evolving into fish or something? Tyler, I don’t know if you’re intentionally baiting me or just joking around. Either way, anti-evolutionist screed isn’t welcome here. If you have honest questions about evolution, take a science class. Great photos! I was in the Galapagos a year and a half ago (that long ago? that recently? – strong everlasting memories) and these pics are great. Thanks for sharing them on the net. You may or may not be interested but given your response to Tyler, I’m going with it. 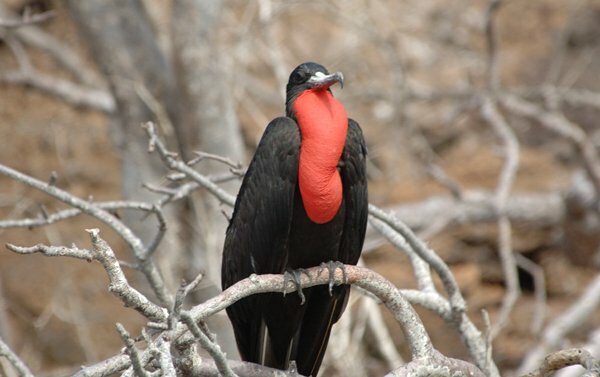 I’m reading a paper right now about how Galapagos mockingbirds’ alarm calls warn marine iguanas to the presence of a Galapagos hawk (predator to both). Thing is, marine iguanas don’t use vocal communications even amongst each other … so how have they evolved behaviourally to understand what the mockingbirds are saying? Cool, eh? Author: Vitousek (2007). Cheers.